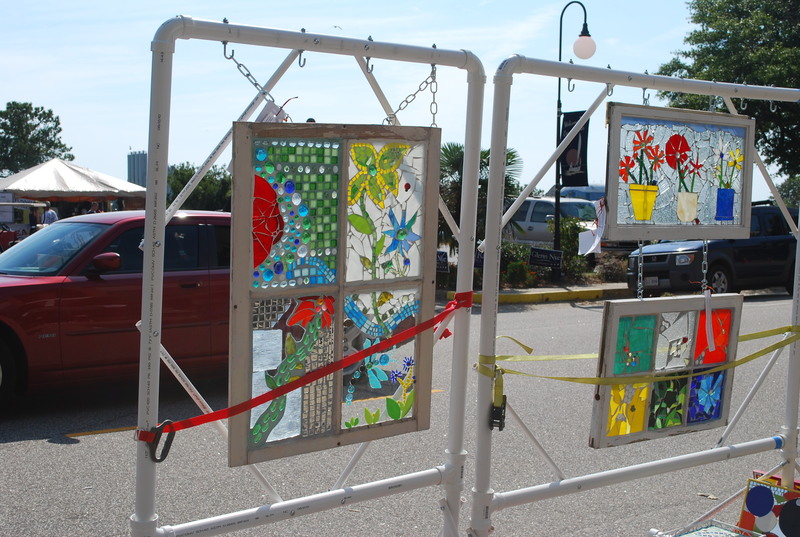 Finding The Silver Lining — How I Ended Up At The Cape Charles, Virginia Tomato Festival After All ! I’m a natural optimist and I do like to find the Silver Lining if I can. When I came down with a terrible cold last Tuesday and by Thursday still felt like a huge nose attached to a worn out body, I realized that I just could not subject the other three who would be in the car with me to a four hour ride to D.C. enclosed with Miss Sneezy. So I said, in my most pitiful voice , you-all just go to the Book Festival without me . (See Sept. 21st post about looking forward to the 2010 National Book Festival ( www.loc.gov/bookfest/ ) being held Saturday, Sept. 25th on the National Mall in Washington D.C. ) Don’t worry about me, poor, poor sick me, said I. Well OK, said they, we won’t worry about you, we’ll be on our way on Friday morning, really sorry you can’t come, we’ll try to get some of your books signed for you, watch the Book TV coverage. But then, ironically, an important client of my daughter’s who was flying in from the mid-West to the Eastern Shore of Virginia to look at waterfront property on Thursday the 24th decided to stay over through Saturday to look at additional beachfront acreage. So that took her out of the trip as well. And then my friend’s son’s lasik surgery got bumped from Thursday afternoon to Friday afternoon, so another one bites the dust. That left only my husband in a position to make the trip, but loyalist that he is, he pledged to stay by my side, replenishing Kleenex and orange juice as necessary, commiserating with my loss of the opportunity to get the books I had purchased by Michelle Norris, Anchee Min, David Remnick and Scott Turow autographed by them, planned as special Christmas gifts for several people. ( I realize that it may not seem all that special. But trust me when I say that after you have stood in line about two hours per each author, in the hot sun, the only food all day being the trail mix and a PBJ you fortunately brought along but which got somewhat squished at the bottom of your rolling briefcase, washed down sparingly by a warm Desani, portapotties about 10 miles off but you are worried about leaving the line in case of a ruckus about getting back in, feet aching even though you’re wearing your most comfortable Birkenstocks, weary arms clutching the max- allowed- per- author three or four books, open to the title pages as ordered by the event staff, yellow post-it notes peeking over the edges of the title pages whereon you have, after much wracking of the brain, written the pithy phrases you want the admired author to inscribe for the recipient…… Well, after all that, I don’t care if it’s just an inscribed “Manual of Insurance Rates” instead of a John Grisham 1st edition — by golly, it is special !!!! ) 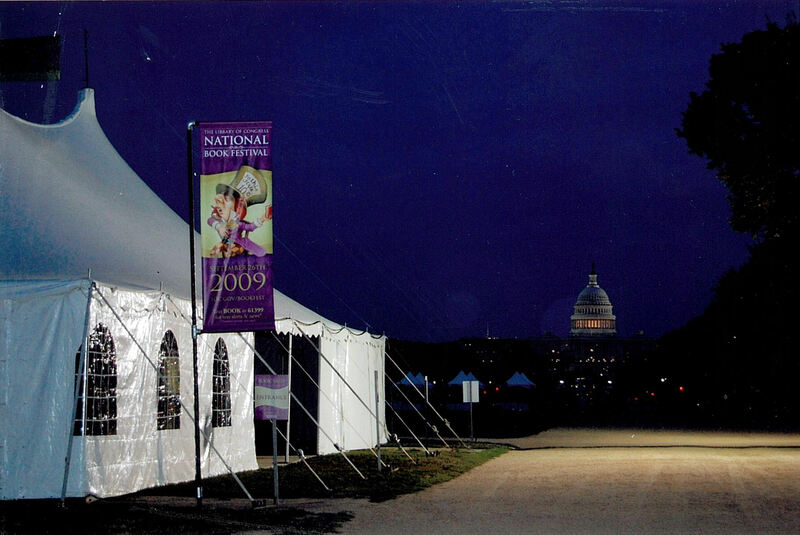 Anyway, the 11th annual National Book Festival is coming up in just 361 more days, wonder who the authors will be ? But back to the Silver Lining. In order to go to the Book Festival, I would have had to miss the 3rd annual Cape Charles Tomato Festival. So now, if I felt up to it, we could attend. Possible Silver Lining. Mid- afternoon, pocket full of cough drops, I summoned up the energy to slip down to Cape Charles with my husband. It was a pretty day, blue skies, warm, breezes blowing in from the Chesapeake Bay. My husband and I both always like the ArtWalk and this year was no exception — lots of mediums exhibited, sidewalk tables plus snow white individual tents featuring watercolors, sculpture, glasswork, oils, stained glass, decoy carvings, etc., up and down Mason Avenue as far as the eye could see. 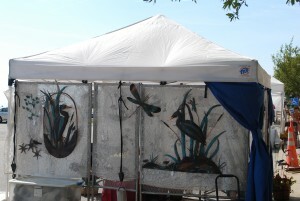 On one of the next- to- last sidewalk tables, I came across my art purchase of the day……. a whimisical watercolor, original and framed, a pair of charming orange seahorses, outlined in red, with large aquamarine eyes, set against a vivid backgound of various blues, white bubbles and little red hearts floating upwards as the seahorses shyly peek at each other. The whole painting was so vibrant, I love seahorses, I have a perfect place to hang it, I could not resist. Continuing on down the sidewalk, past those last lucky diners to be able to enjoy a bowl of the ambrosial tomato basil bisque being served at Cape Charles Coffee House, we crossed the street to see the antique cars exhibit. Arriving just after the judging was completed, we watched as the trophies were being awarded. Although I am not that into cars, I was impressed with the 1930 Model A, black of course, which looked like it just rolled off the assembly line. ( You’ll remember that Henry Ford famously said that his customers could have the Model A in any color they wanted—- just as long as they wanted black ! ) Among others, a trophy was awarded to a 1955 mint condition Chevy painted in beautiful tones of cream and deep burgandy, owned by MaryLou and John Thornton, whose cute-as-a-button two year old grandaughter, Andrea, stole the awards ceremony as she presented the trophies. And that pretty much did it for me, tired, still not fully recovered, ready to go home and flip on the television. And so, a Silver Lining after all — I got a fun painting at the Cape Charles Tomato Festival and then spent the rest of the afternoon in comfy air conditioning, enjoying Book TV’s ( www.booktv.org ) live coverage of the National Book Festival direct from C-Span’s little studio set up in the huge History and Biography pavilion, temperature in D.C. estimated at a hefty 90 + degrees and no Chesapeake Bay breezes. Hi, ho Silver Lining. 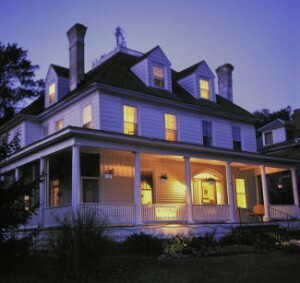 Looking to buy a historic property in Virginia ? 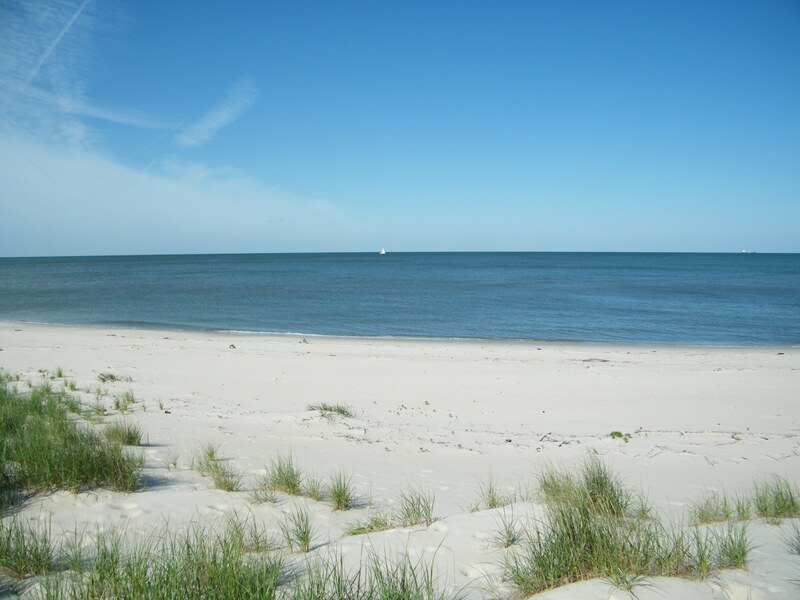 Consider purchasing real estate on Virginia’s Eastern Shore in the quaint historic town of Cape Charles, perched along the sandy shores of the Chesapeake Bay. Cape Charles today continues in its historic coastal traditions and many of the town’s activities center around its deep water harbor, marinas and its beautiful sand beach. Most of the 500 buildings in the original part of town date back to the late 1890’s and this section of town has been designed as a “Historic District” . 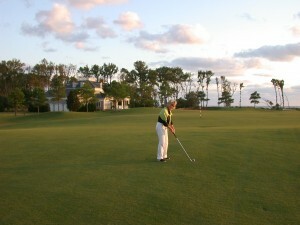 In addition, about 10 years ago, the acreage which now comprises the golf resort were annexed by the town and now form its northern and southern boundaries. Most of the new homes built there are of a traditional style and blend well with the homes in the Historic District, creating a harmonious whole from the sum of several parts. 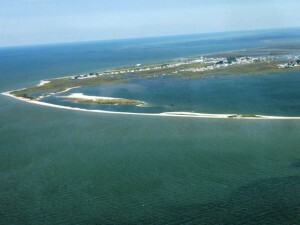 Cape Charles has an interesting history– it was actually created from scratch by a Pennsylvania Congressman, Wm. Scott, who purchased the land which is now Cape Charles after learning that its deepwater harbor was to become the southern terminus of the railroad. ( Obviously, insider trading is not a new phenomena ! ) In 1883, Scott began the process of development, laying out the town as a square, creating a five acre space for a future central park (see the Sept. 11th post on the dedication of the beautiful new Cape Charles Central Park), naming the avenues for famous Virginians (Washington, Jefferson, Madison, etc., ) and the streets for what I’m assuming were his favorite fruits ( Fig, Strawberry, Peach, etc.) and then proceeded to sell building lots. 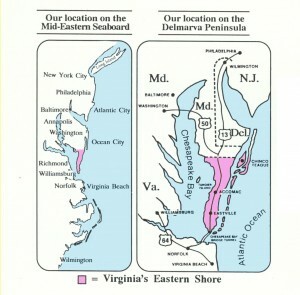 Between the strong economy generated by the new railroad, which ran from Manhattan to the Eastern Shore, and the busy ferry service from the harbor ( which took both rail passengers and cars across the Chesapeake Bay, landing in Norfolk ), Cape Charles quickly became a busy and prosperous waterfront town. Grand homes were built along the beachfront and in the beach blocks, more modest homes further back. By the early 1900’s, most of the lots had been built out, in a potpourri of architectural styles ranging from Victorian, Queen Anne and Georgian to Sears Craftsman cottage style homes, with Gothic and American four square as well. 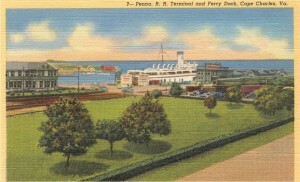 Sadly for Cape Charles, by the mid-1950’s, the railroad retained freight service but terminated passenger service and postal service to Cape Charles. And in the cruelest cut of all, the ferry company moved to a new terminal at what is now part of Kiptopeake State Park, nearly five miles away. Adios, so long, sayonara to Cape Charles, which sank into a slow decline with the loss of its two economic engines. 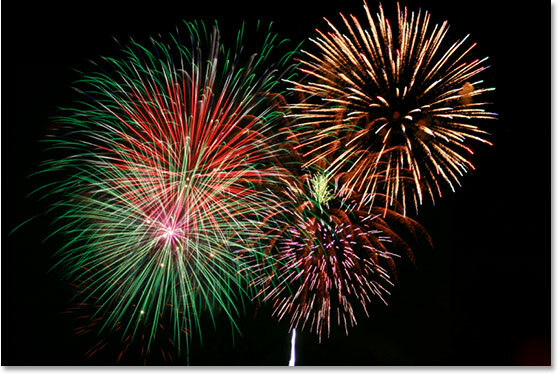 Fast forwarding to 2010…. With the completion of much of the golf resort and the revival of interest in buying and restoring historic homes in coastal towns, the renaissance of Cape Charles and restoration to its intended glory is nearly complete. And it’s exciting to see a variety of opportunities for people to be able to purchase real estate in the historic area of Cape Charles and to be able to enjoy the ambiance of yesterday in a home which has been restored to its original elegance. This post will feature a lovely restored historic home listed by Blue Heron Realty Co., a marvelous Georgian Revival. Interestingly enough, this home was previously a B&B so the restoration fortunately included adding a private bathroom to each bedroom, the acute shortage of bathrooms being to my mind one of the thorny issues that always has to be dealt with in restorations of historic homes. Built in 1906, this 4200 square foot Georgian Revival home has been fully restored to its former glory ! 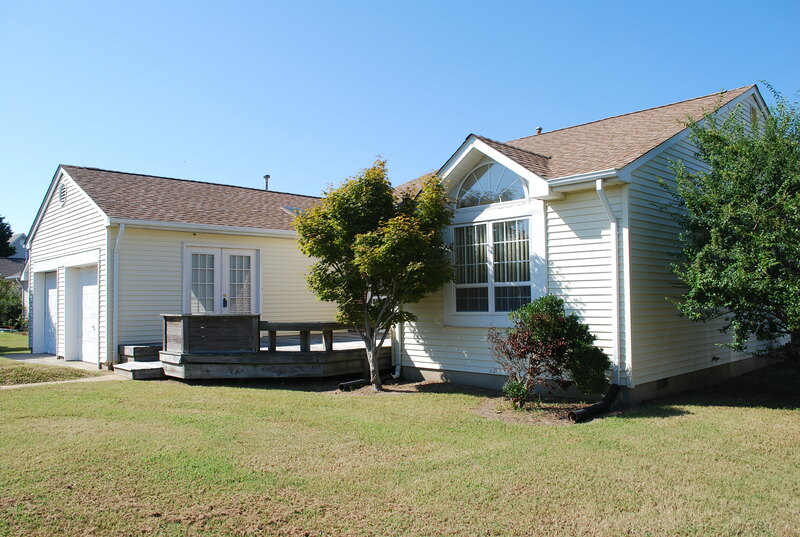 Located just two blocks from the beautiful Cape Charles town beach, this home reflects the best traditions of gracious Virginia living. With spacious formal rooms and seven bedrooms plus eight and a half baths, there is plenty of room for private entertaining or it could be returned to its B&B status. 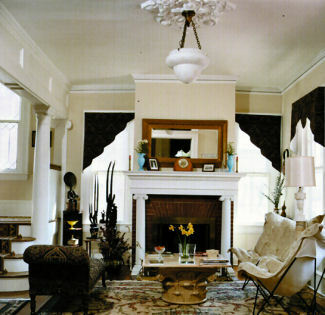 The stately entry foyer features the original ceiling medallion with light fixture and original leaded glass windows. Wood floors have been beautifully restored and the 12 inch baseboards have top and bottom shoe molding. The large dining room is light -filled and simply spectacular with four floor-to-ceiling windows, original ceiling medallion and gasolier chandelier. Original carved fireplace mantel adorns the gas-converted fireplace in the spacious living room which also features pocket doors. Warm and cheerful, the gourmet kitchen features Wolf range, Viking hood and side by side refrigerator– everything you would need to fix a fabulous crab au gratin with your fresh- from- the- Chesapeake- Bay lump blue crab. Large Butler’s Pantry, plenty of storage. Outside, a lovely wisteria-covered pergola and a hot tub as well as a detached office with a sleeping loft create private spaces for work and leisure. Located on a corner lot in the Cape Charles Historic District, this gracious, lovingly restored home is but a short stroll to the beach and a quick golf cart ride to the two marinas, Palmer or Nicklaus golf, little shops, art galleries, the Palace Theatre and fine and casual dining. Could it get any better ? So get ready to live the sweet beach life in the romantic ambience of yesteryear. Priced at $599,995. 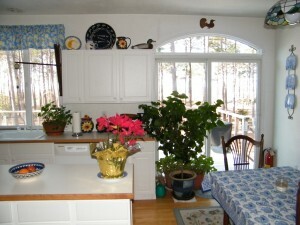 ( For more information on real estate and historic homes for sale on Virginia’s Eastern Shore, click on the “historic home listings” section of the Blue Heron Realty Co. website www.blueheronva.com . Kayaking on Virginia’s Eastern Shore is a well-known passion of mine. But I’m not worried about my secret spot becoming overrun by kayakers because it’s getting mighty lonely paddling around out there all by myself. Save for the bald eagles, osprey, great blue heron, kingfisher, and assorted other shore birds that migrate through the area, that is, so actually it’s not lonely at all, just really wonderfully peaceful and relaxing ! Having paddled Westerhouse Creek almost daily now, going on 9 years, the number of times I have encountered another soul I could count on both hands. This small saltwater inlet from the Chesapeake Bay near Machipongo, Virginia in Northampton County has an absolutely pristine shoreline and is edged in the softest way by thick stands of tall green spartina grass. I have yet to become jaded to the sublime beauty of this place, and especially its lack of disturbance by human encroachment. 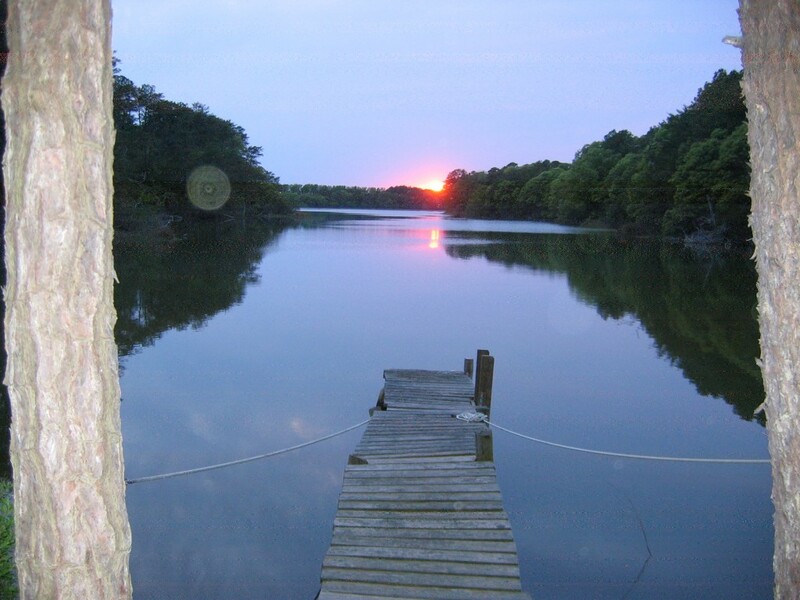 Although others live along the shores of this beautiful channel, near sunset or sunrise it seems to be mine alone. Launching my 17 foot long sea kayak into Westerhouse Creek from my backyard finger pier is a breeze. I climb down a short ladder to balance before scooting into the cockpit, sitting as comfortably as if I was lounging in my living room. All is quiet, the sun is starting to set and shortly a full moon is due to rise in the east. The beauty of paddling a kayak lies in its unobtrusiveness in the natural surroundings and ease of movement through the water. I feel at one with nature as I glide upon the fluid surface. This little salt water estuary is really a miniature Eastern Shore creek, with all the features shrunk down so that an hour’s paddle takes you through the various topographical features that comprise an entire healthy ecosystem. The headwaters of the creek are wetlands that capture the drainage of fresh water from as far away as Lankford Highway (Rt. 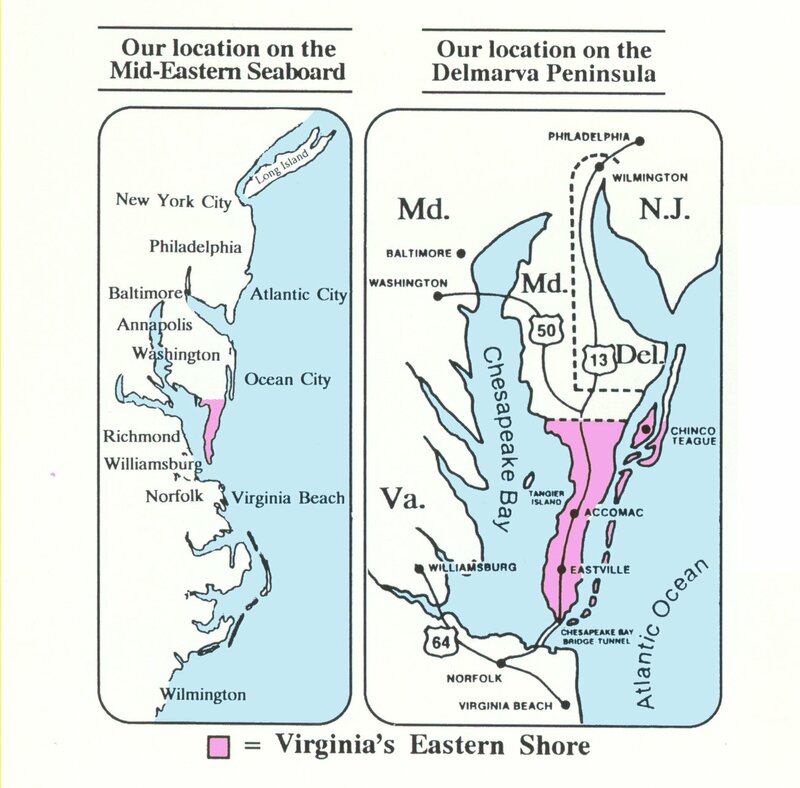 13) which runs along the spine of the Delmarva Penninsula. The marsh soon gives way to open water as the opposite banks of the stream open wider and wider apart. Behind the spartina grow thick stands of long and short needle pines and hardwood trees. In the fall, the change of color of foliage creates a rainbow along the both shores, pine greens contrasting with the brilliant hues of reds, orange, pinks and yellows of the hardwoods. In the early spring, the white dogwood blossoms are the first flowers to appear through the leafless branches, a welcoming sight. My goal each trip is to paddle the length of the entire creek, passing out between the sandy shores of the mouth where the creek empties into the Chesapeake Bay. There, when the wind is blowing strong from the northwest, I love to catch the waves and virtually surf the kayak back homewards into the mouth of the creek, almost California style. One evening in early May, in a fairly stiff breeze, I paddled out through the breaking 2-3′ waves and turned to catch one back to shore, but a rogue wave hit me sideways and and for the first time ever, tumbled my boat upside down so fast I hardly knew which direction was up. I found myself suddenly immersed in an inverted position and I literally fell out of my kayak and rose to the surface sputtering water from my mouth. It was cold water, too, and the waves were breaking all over, and I was a little worried about being slowly pulled out into the Bay by the falling tide. Luckily, a couple of weeks earlier I had finished a series of four classes in a YMCA pool in Virginia Beach to train on how to perform a kayak self-rescue and of course, as always, I was wearing a life vest. The cold water was starting to sap my strength but I stripped off my waterlogged sweatpants, gathered my thoughts and planned my every move. Relying on an inflated bag fitted over one end of my paddle to steady the tippy craft, I climbed aboard in the breaking surf and rolled inside the boat. Using the bilge pump, I emptied the water from my kayak and steadily started paddling back towards the mouth of the Creek. Whew! What a relief to be afloat again and heading for home! Maybe, I thought, on the next windy day I will just turn around in the Creek and not head out into the Bay to surf back on a wave. Or……… maybe I’ll just keep on being adventurous ! This evening, however, the water was quite calm so my paddling was as peaceful and easy as could be, total relaxation. 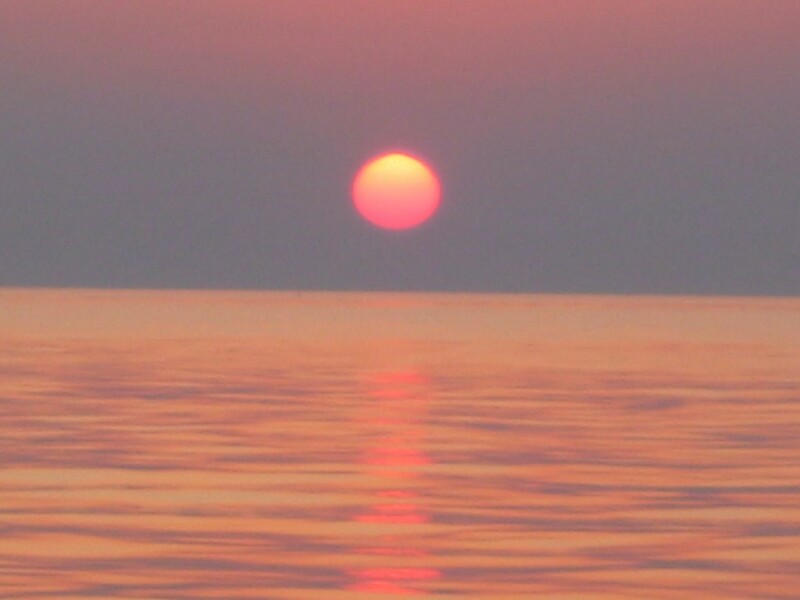 The sun began painting the waters in vivid shades of purples and pinks. And out in the Bay, I gazed up and down that beautiful shoreline, then turned my kayak for home, spotting the white disk of moon peeking above the distant treeline. My Westerhouse Creek finger pier perfect for launching kayaks. 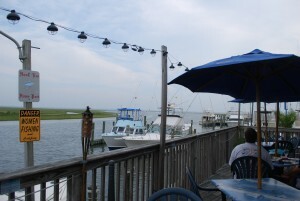 One of the nice things about living on the Eastern Shore of Virginia is how easy it is to go elsewhere. Sort of an oxymoron thought process– it’s good to be here so I can go elsewhere. But it’s true ! 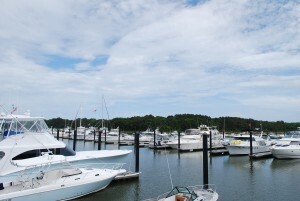 Virginia’s Eastern Shore is actually within a half day’s drive of many of the great spots on the East Coast, it’s the perfect place to buy a property which is a home base for get-a-way trips to lots of exciting events and places. About six hours from my office door to emerging from the Holland Tunnel onto Canal Street in Manhattan.. .. dim sum in Chinatown is calling to us. ( And we love the roast pork buns and coconut buns at Maria’s Bakery on Mott Street. ) About three hours to Charlottesville and the beautiful vistas of the Blue Ridge mountains and some of Virginia’s finest wineries ( www.monticellowinetrail.com ). About four hours to Baltimore, site of Inner Harbor and its fabulous aquarium and of course, Annapolis is nearby. And let’s not forget about Virginia’s Golden Triangle, the historic towns of Jamestown, Yorktown and Williamsburg, so close, only an hour and a half away ( www.historictriangle.com ), always lots of interesting things going on there. Over the Christmas holidays we nearly always visit Colonial Williamsburg ( www.history.org ) to enjoy the bonfires, fife and bugle corps , the nightly Illumination of the Christmas Tree, the stunning all -natural decorations, topping it off with a fabulous dinner at the Regency Room at the Williamsburg Inn. At any rate, the 2009 Festival, which was a two day event, also featured acclaimed authors Nicholas Sparks, Lee Childs and Daniel Silva (both of whom I particularly enjoy ), Michael Connelly, James Patterson, Judy Blume, Sue Monk Kidd, Jon Meachum ( whose book American Lion I had just finished reading ) and Gwen Ifill, the excellent moderator of PBS’ Washington Week, plus many other novelists, poets and non-fiction writers. About a thirty-fecta of literary talent, all in the very same place on the very same week-end. Can you believe it ??? Thank-you, Library of Congress !! 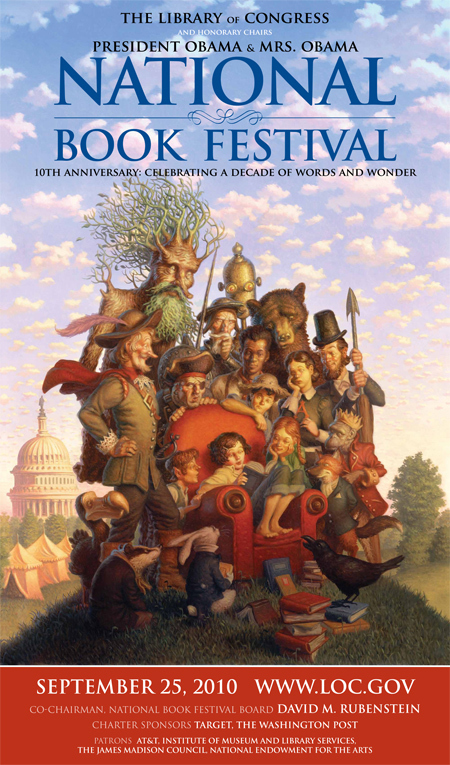 Anyone who truly loves books and reading can appreciate the real thrill of attending the 2009 National Book Festival and seeing, hearing speeches by and getting books autographed by some of ones favorite authors . So although, for me, the 2010 Festival doesn’t have the same star power, my husband and I, a daughter and a friend are all looking forward to leaving the Eastern Shore, making that easy trip to spend the week-end in Washington DC and hearing Ken Follett, Scott Turow, Anchee Min, Michelle Norris of NPR and David Remnick speak and getting them to autograph their books for us — and yes, I’m thinking Christmas as well. ( A signed, first edition copy of a book by the giftee’s favorite author makes a great Christmas present, especially when it comes with the story of how the giftor stood in line forever in the sun/rain/dark of night, feet aching, just to get it autographed especially for them. ) So let’s hear it for books, authors and the brick and mortar book stores like Barnes and Nobles and Borders who hold the world within their four walls ! And let’s hear it for living on the Eastern Shore of Virginia, so centrally located that a whole other lifestyle dimension is opened by the ease with which you can get away to so many other places ! Applause, applause, applause, ad infinitum ! 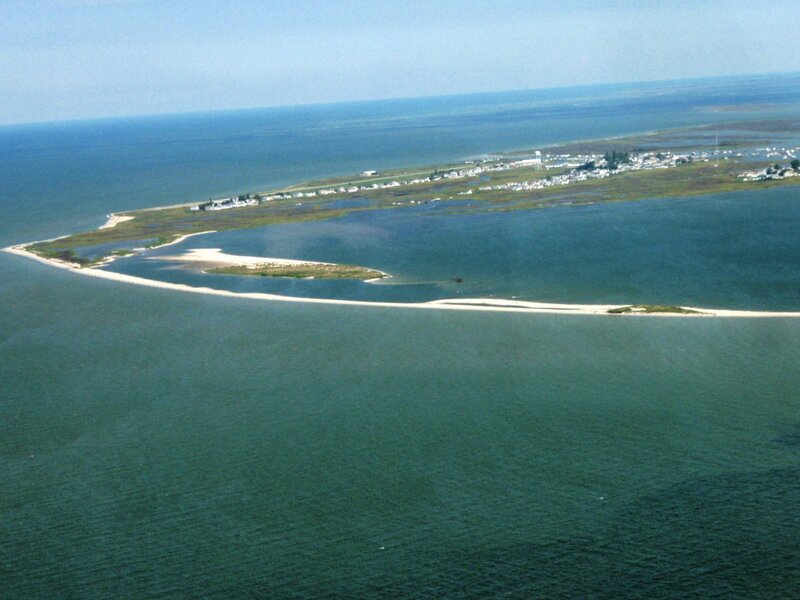 Tangier Island, Virginia — This Tiny Island In The Stream Hits The Big Time On ESPN ! Originally settled in the late 1700’s, the Island’s population has shrunk from about 1500 in the early 1900’s to under 600 today and that’s counting every man, woman, child and parakeet. Golf carts, bicycles and feet ( yes, actual walking from place to place on shank’s mare ) are the main forms of island transportation. One place visitors always want to stop at on Tangier Island is the Chesapeake House, a quaint B&B and excellent restaurant serving veritable feasts of crab cakes, crab soup, crab fritters, fried soft shell crabs, Virginia country ham, the best hot yeast rolls ever and other delicious home cooked, mouth-watering foods. Homemade pound cake with strawberries in season, yes, yes, yes. 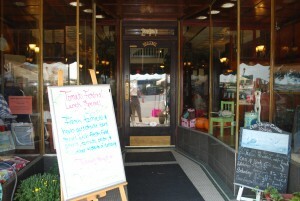 ( www.chesapeakehouse/tangier.com). And, of course, everything crab is so fresh it was probably still swimming around the night before because the seafood business is the main business on Tangier. So, if it’s crab and it’s from Tangier, it has got to be good. 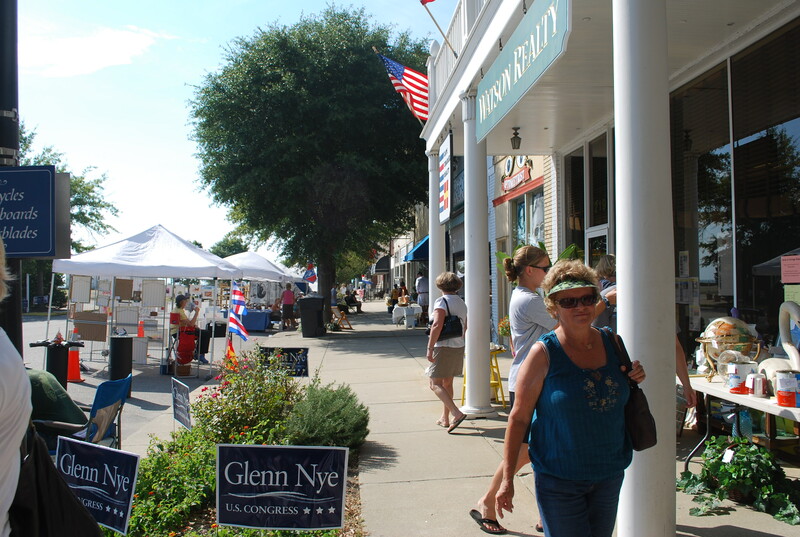 The Fun-Filled Cape Charles, Virginia Annual Tomato Festival ! It’s Right Around The Corner, Don’t Miss It ! When is the only time of year when dressing up like a tomato is not only acceptable, it’s de rigueur ? Tomato Festival time, of course, that wacky, fun time of year in Cape Charles, Virginia when marinara sauce meets “Beautiful Baby” contest. And where you must wear red ( and preferably a tomato-like Mardi Gras style costume ) in order to get into the annual Tomato Ball. Talk about putting on the Ritz, it’s definitely time to dust off those zippy red slingback heels and get ready to step out with your baby tonight !! On Friday, September 24th, the 3 rd Annual Cape Charles Open golf tournament will be held at Bay Creek, with a portion of the proceeds benefiting the United Way of the Eastern Shore. This event is open to the public and is a great chance for non-member golf enthusiasts to strut their stuff on the incredible Arnold Palmer Signature course, which was designated last year by Golf Digest as one of its “Best Places To Play”. This 7204 yard beautiful waterfront course, with perfectly manicured greens and fairways, is built along the shores of the Chesapeake Bay and Old Plantation Creek, a bay inlet. Most golfers say that it’s hard to keep their eyes off the scenery and on the ball, so participants in this event will just have to try to ignore the sparkling waters, soaring ospreys and gorgeous landscaping to focus instead on less interesting matters like stance and swing. A golfer’s life is hard but someone has to do it …..
For foodies, there are mouth watering tomato pies, bubbling, wonderful fragrant aromas for as far as the nose can smell. I’m sure the local tomato pie champions ( who actually were invited to Washington DC to cater an Inaugural event in 2008 ) will be there, holding forth with their ambrosial offerings. ( If you’ve never had tomato pie, think a perfection blend of tomatos, cheeses, herbs and spices in a rich, rich crust. ) Other food vendors will be there preparing regional specialties plus wine and beer tastings usually are held as well. Definitely no fear of hunger at the Tomato Festival. And of course the week-end “Pizza Train” luncheon ride and evening gourmet dinner trip will be running on the usual schedule, as always, advance tickets required. All aboard, all aboard, train buffs. 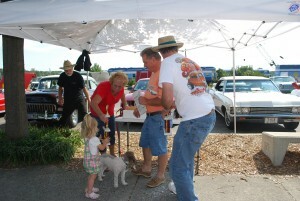 For kids, special contests and events are scheduled including the always fun Face Painting booth. Also for kids and kids at heart, there will be an antique and classic car show, always a great hit. 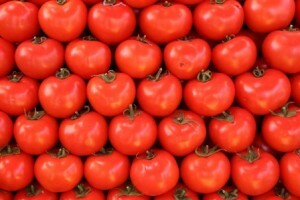 For the girls there will be a no-swimsuit “Miss Hot Tomato” contest as well as a pre-teen tomato contest. The demands of the baby lobby are covered by the “Beautiful Baby” contest. Last year music lovers were entertained by the Pop, Rhythm and Blues concert featuring Clarance Smith, presented by Art’s Enter at the Palace Theatre. So I think that just about covers everyone — foodies, golfers, music lovers, babies, teens and pre-teens, kids, car enthusiasts, art aficionados, train buffs, tomato costumes, dancing the night away at the Tomato Ball….. is there anything else that can be piled into this fun, wacky, tomato week-end ? Just one more thing ? Yes, of course…. for everyone out there who loves a parade, the Tomato Festival Parade kicks off on Mason Avenue at 10 AM. Last call, anything else ? 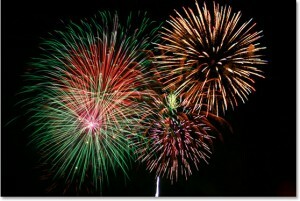 Yes, the fireworks ! High in the sky above the Cape Charles beach and reflected in the waters of the Chesapeake Bay, the brilliant flares and ka-booms of the fireworks show brought the 2009 Tomato Festival to a ( http://www.capecharles.biz/fallfestival.html ) to a dramatic close. Yep, with the parade and the fireworks, there truly is something for everyone. So, everyone, remember, it’s coming, it’s right around the corner. Get ready, get set, mark your calenders, it’s tomato time in Cape Charles on Virginia’s Eastern Shore ! 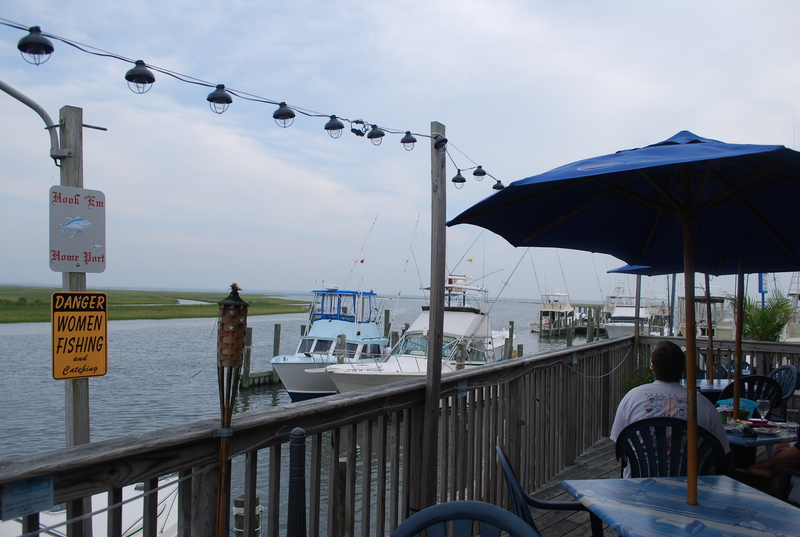 Enjoying a meal at the Island House Restaurant in Watchapreague, Virginia is not merely about the food. Definitely not ! 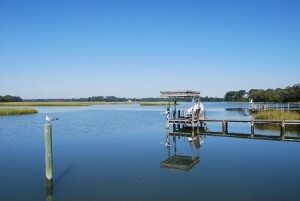 Perched at water’s edge on Finney Creek, a deepwater inlet from the Atlantic Ocean, which languidly winds its way through the emerald green marshes and out to Metompkin Inlet, a trip to the Island House offers a unique little peek into the Seaside on Virginia’s Eastern Shore. Watchapreaque itself , now a quiet little residential town with a population of about 300, was the site of the once bustling Hotel Watchapreague, now gone, a well-known resort frequented by all sorts of celebrities in the early 1900’s. 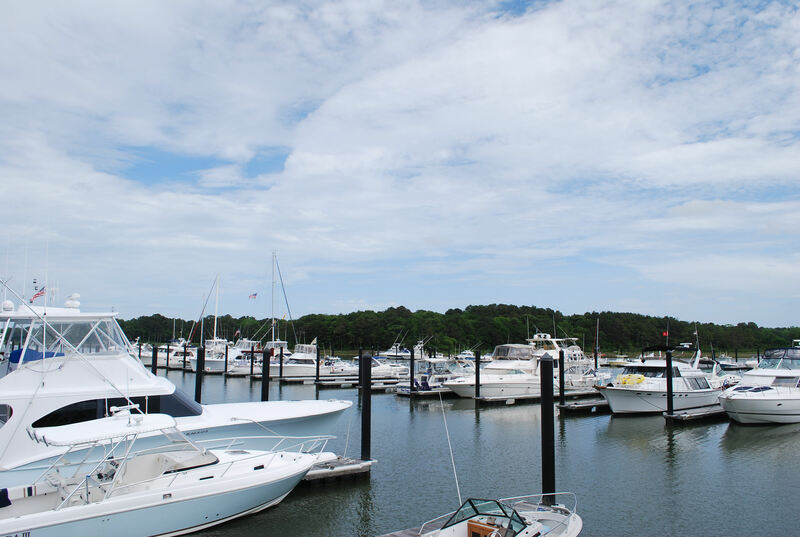 Now home to a large private marina with an impressive fleet of charter fishing boats, greater ” downtown” Watchapreague also boasts a town marina, a marine railway and several boat ramps, all catering to those who love the excellent sports fishing and boating nearby. A Toss Up - Eat Or Launch The Boat ? Clearly, after a brisk morning out on the water there are going to be some mighty hungry people coming ashore looking for sustenance and who better to provide it than the Island House Restaurant Needless to say, it offers seafood of all kinds but specializes in a fresh catch of the day as well as local crab, oysters and clams. My husband and I especially enjoy their delicious clam chowder and crabcake sandwiches, a perfect lunch harvested from our salty Eastern Shore waters. And what better place to eat it than out on the Island House’s large veranda, watching all the activities going on around us. 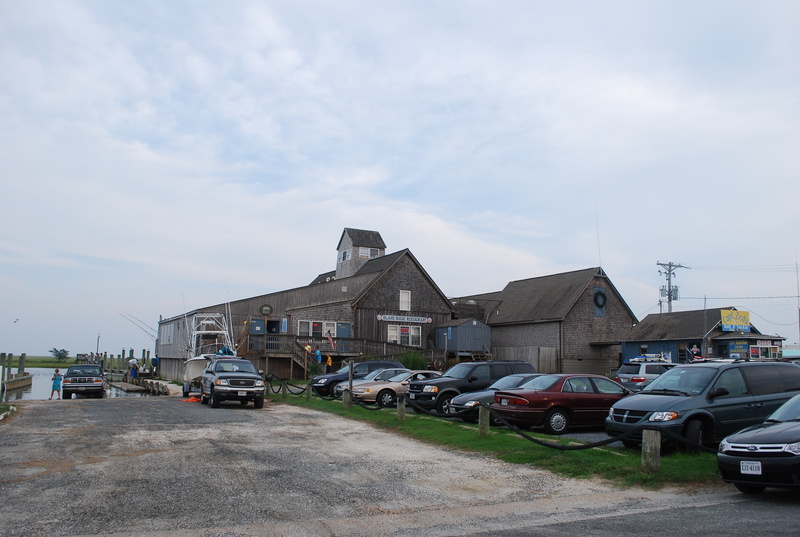 The restaurant is nestled in between a boat ramp and Watchapreague’s largest marina so there is always lots of interesting stuff happening on all sides. Smaller boats being launched at or being pulled out at the adjacent ramp, little snatches of conversation and laughter floating up, big boats gliding into the marina, people waving and calling out to each other, tides rising and falling, seabirds on the wing trying to catch a little lunch for themselves. 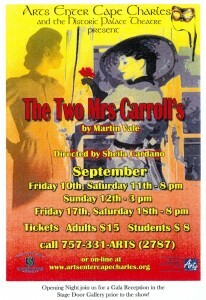 To The Cast Of “Two Mrs. Carrolls”, Take Another Well Deserved Bow ! 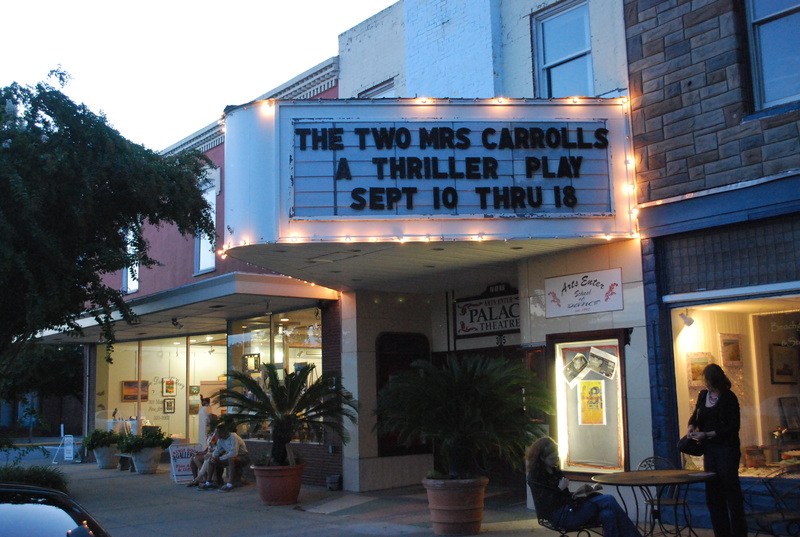 My husband, a friend and I spent a delightful Sunday afternoon last week at the historic Palace Theatre in Cape Charles, Virginia watching the matinee performance of ” The Two Mrs. Carrolls”. It was one of those cool, rainy, constant drizzle Sundays that usually make me feel like staying at home with a hot cup of tea, listening to The Splendid Table on NPR or thumbing through the latest Contessa or Mario Batali cookbook, wondering if there is a delicious recipe of less than five ingredients that can be whipped together in 15 minutes ( good luck with that ! ) . However, we had matinee tickets for the play and off we went, rain or no, to see the Mrs. Carrolls. I was not familiar with that particular play, written by Martin Vale, but the playbill indicates that it is a film noir classic from 1947 and starred Hunphrey Bogart and Barbara Stanwyck. A comic thriller set in the South of France, it revolves around a lovey-dovey, newly- wed English couple ( but the husband, an artist, has a roving eye ), the wife’s old flame who visits a lot, a beautiful young neighbor who also visits a lot and a very funny French housekeeper, Clemence , who can speak English but insists on speaking French throughout, sans peur et sans reproche, played with good comic effect by Susan Kovacs, a Blue Heron customer . 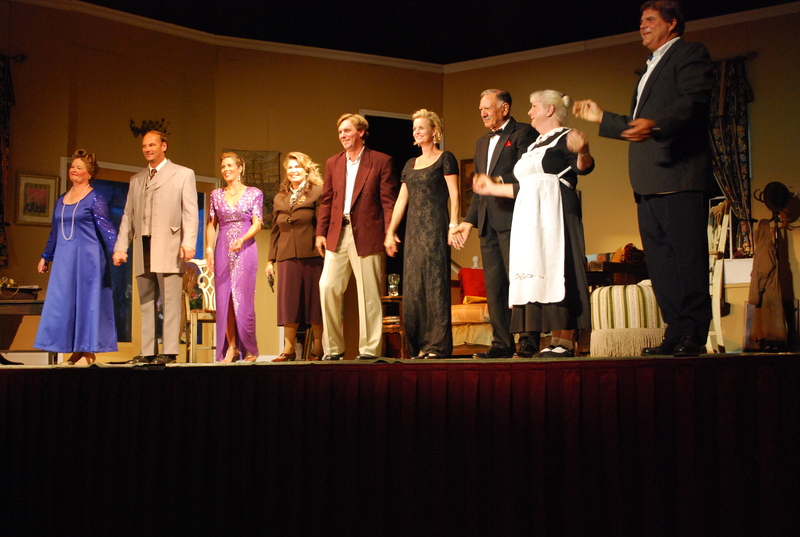 The wife soon falls mysteriously ill and the play is off and running ! Bravo ! Take Another Bow ! Staged and directed by Sheila Cardano, whose daughter, Clelia Sheppard, is the Executive Director of Art’s Enter, the play came off wonderfully– the years of Sheila’s hard work and efforts to put together a talented local amateur theatre group and stage crew and to renovate the Palace Theatre have really paid off handsomely. The theatre, now fully restored, truly looks great. ( Years of fund raisers together with grants and donations have restored this lovely Art Deco building to its former 1940’s glory. Wow ! And you should see the seats now, comfy and beautifully re-covered, to the tune of hundreds of dollars each and the gorgeous golden wall murals. Before and after pictures really tell this amazing restoration story and illustrate how far the Palace Theatre and Art’s Enter have come in these last 15 years. ) 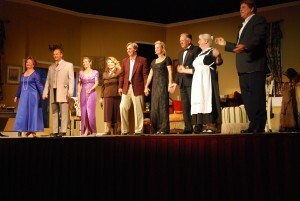 On stage, the props and scenery looked great– so authentic, you felt like you really were in an artist’s home. Lots of well done lighting and sound effects too, especially the mistral wind, which blew on and off for much of Act 3. Best of all was the cast, who vividly brought this story to life. Consisting of nine amateur actors from various walks of life, including a recreational director, a vacation rental associate, three retirees, a real estate sales agent, a real estate broker, a Deputy Commissioner of the Revenue plus Clelia Sheppard, the Executive Director of Art’s Enter and one of the Eastern Shore’s great multi-taskers, this cast came together seamlessly to create the story’s realistic voice. It was an excellent performance, thoroughly enjoyed by the entire audience. I realize that I am biased but the three of us really loved seeing our two colleagues from the Blue Heron Realty Co. Cape Charles office , Eva Noonan and Dave Kabler ” do their thing” on-stage, both presented an accomplished performance, with Eva cast in the leading role of Sally Carroll. And so, to the entire cast, at the next performance go ahead and take an extra bow— you deserve it ! 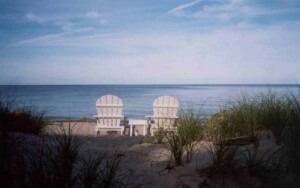 Looking To Buy Beachfront Property In Virginia ? 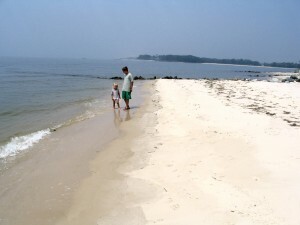 The Eastern Shore of Virginia Has Some Great Beach Real Estate Deals ! Great news ! If you’re looking to purchase beach real estate in Virginia, the Eastern Shore is the very best location in Virginia to find both beachfront and beach access property at affordable prices, great prices that make the heart beat a little faster and fingers itch to grab a pen and sign some papers. 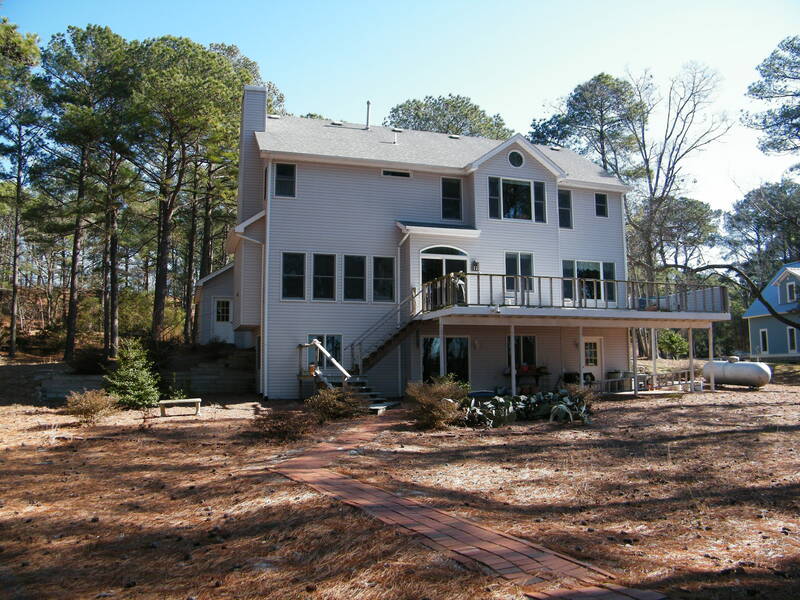 Sure they have beautiful beach property in Virginia Beach, less than an hour away. But who wants to pay about a million dollars for a 40 x 175 lot and share with about a billion tourists ? Fine if your job places you there and you love the beach. 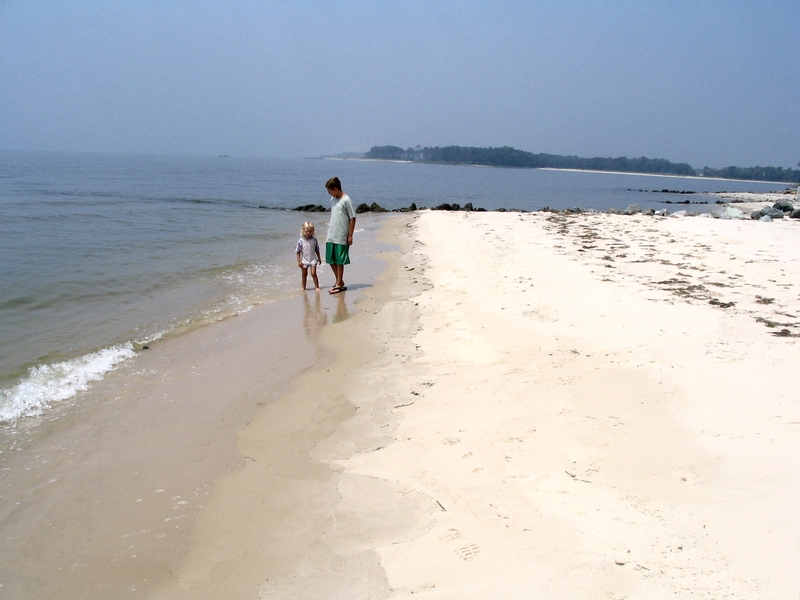 But if you’re looking for a leisure home, a retirement home or just plain relaxed, low key year-round living and would prefer private and pristine low density neighborhood beaches at an actually affordable price, then Virginia’s Eastern Shore could be the place for you ! In this blog post I’m featuring a beachfront home, a waterfront cottage with deeded beach access and a beachfront lot for sale. All of these properties are great deals ! 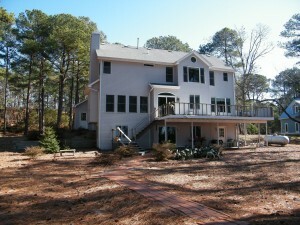 The beachfront home at $995,000 is a truly wonderful purchase opportunity. It’s a lovely 3 bedroom home on nearly two acres, wooded, with almost 200 feet of magnificant beach shoreline in a small, very upscale beach neighborhood. ( Plenty of room to add- on if more bedrooms are desirable. ) This intimate little neighborhood offers a swim & tennis facility and access to a private freshwater lake, nice for those who like to canoe or kayak. For better or for worse, I’m addicted to murder mysteries. No point in trying to deny it because an entire room, a very spacious room even, that was planned as my husband’s home office with space for my books, CD’s and DVD’s has now evolved into my library with space for my husband’s desk and file cabinets at the far end, by the full wall of windows. ( Well, at least I let him keep the windows, which are floor-to-ceiling, south-east facing and overlook our beautiful rolling lawn, bird feeders, trees and pretty sunrises. I feel that makes things even-steven but I don’t think he really agrees. ) Six tall bookcases, books I’ve already read but want to keep stacked at least two rows deep, books I’m planning to read sitting on my “read this next” table, about 30% of which are murder mysteries or courtroom dramas, not the gory ones, just the good, old-fashioned sleuthing- through- clues to find the bad guys kind. ( I think I could probably write a book, a thick, heavy tome, about the books that I love…. I do read a lot of non-fiction too but let’s face it — not as much fun ! Currently reading “The Immortal World of Henrietta Lacks”, fascinating but not nearly as satisfying as a John Grisham thriller. ) Two tall bookcases of DVD’s including, more or less, the complete sets (or working towards complete ) of most of BBC’s great mystery series. (Let me recommend www.bbcamericashop.com as an absolutely “must view” website. ) Inspector Morse, Foyle’s War, Sir Peter Wimsey, Rumpole, Prime Suspect, MidSomer Murders, Last Detective, Poirot ad infinitum, Sherlock Holmes, P.D. James, etc., etc. (all on the dramatic side) on stand-by on the shelf, ready to be watched or re-watched at a moment’s notice. Plus light and humorous favorites like Hamish McBeth (was TV John a delightful character or what ? ), Campion, the new(ish) Miss Marple series staring Geraldine McEwan ( BBC’s best Marple ever ), Rosemary and Thyme, Hetty Investigates and the wonderful series we are currently viewing, Pie In The Sky…. impatiently waiting for UPS to deliver Series 3 ( which was originally shown in the U.K. about a thousand years ago but just released in the U.S. on DVD September 7 th, why on earth BBC waits so long I can not imagine. ) Anyway, hopefully Monday. What the mystery lover’s life would be like without the British Broadcasting Corporation — well, I shudder to think ! ( We love British comedy too but no space for that commentary now — except to say that anyone who doesn’t practically fall right off the sofa laughing while watching Black Adder, Faulty Towers or Vicar of Dibley simply doesn’t have much of sense of humor. Watching an episode of Father Ted is like eating potato chips– you cannot stop at just one ! ) But enough already about BBC videos. 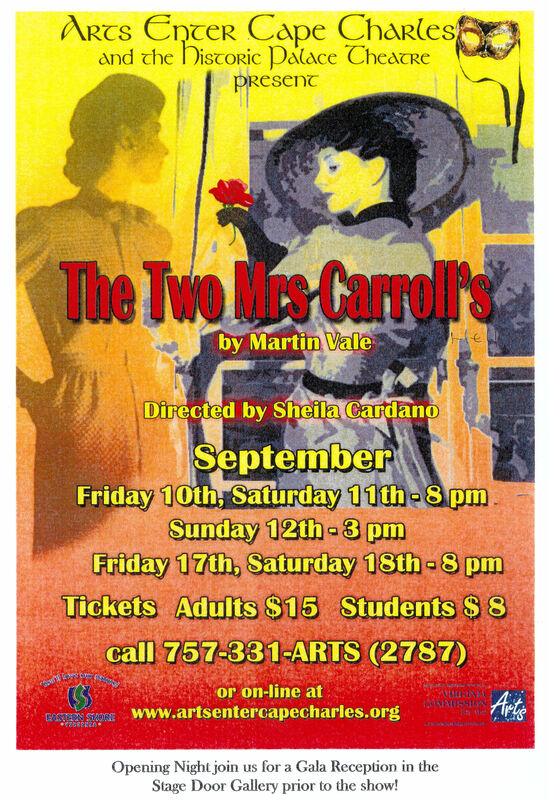 So naturally I’m really looking forward to seeing the latest production this week-end at the Palace Theatre, ” The Two Mrs. Carrolls” , a mystery, produced by Art’s Enter. A word, or three, about Art’s Enter, actually headquartered in Cape Charles’ historic Palace Theatre, and its successful efforts to bring the visual and performing arts in the southern tip of Virginia’s Eastern Shore under one roof. Lucky ! Fortunate ! Favored ! 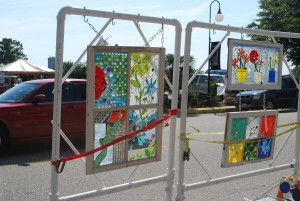 That is what Cape Charles is to have Art’s Enter as a vibrant part of the town and its culture ! 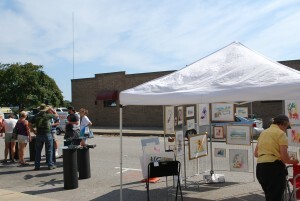 And flipping to the other side of that coin, that’s what Art’s Enter ( http://www.artsentercapecharles.org ) is to have the love, support and participation of the people of Cape Charles. So, a synergistic relationship, benefiting all. 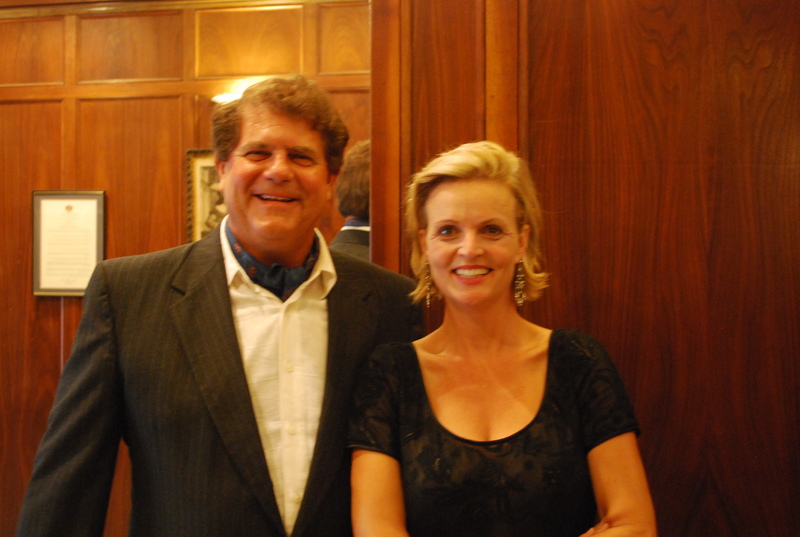 This truly amazing arts group, headed up by Co-Directors Clelia Sheppard and Mary Ann Roehm, has brought such well known organizations as the Virginia Symphony Orchestra and the Virginia Opera Company, both headquartered in Norfolk, to the Palace Theatre for performances. ( It tickles me no end that the Virginia Symphony Orchestra, which has performed at many national venues including the world renowned Carnegie Hall, has actually also performed, several times even, here on the Eastern Shore at the Palace Theatre. Thanks Clelia and Mary Ann — you’re amazing ! ) And dozens and dozens of other high quality vocalists, dance companies and orchestras recently including the Cab Calloway Orchestra, David Leonhardt Jazz Group and Lee Jordan-Anders have lit up the Palace’s stage. 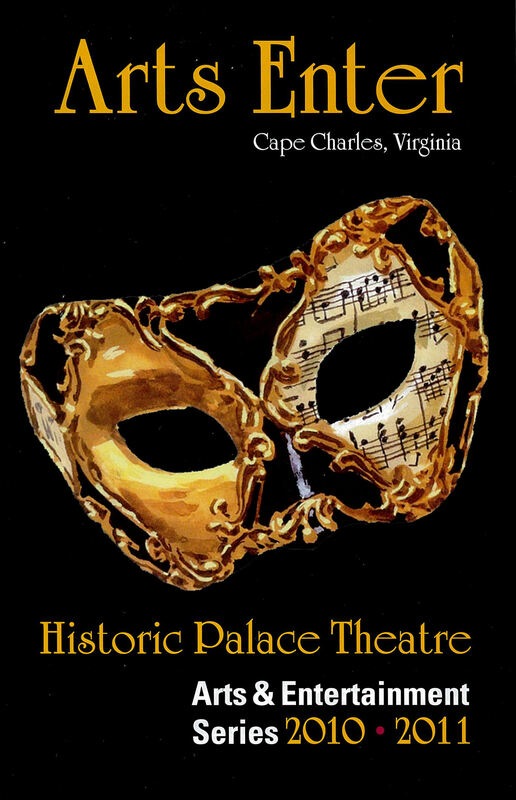 It is also a beehive of activity for the Eastern Shore of Virginia’s growing thespian community, providing a wonderful theatre season right here in our own community. The performances last season included an evening of one act plays, “The Wizard of Oz” and “A Christmas Carol”. 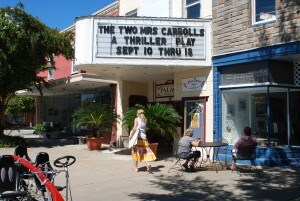 In addition to “The Two Mrs. Carrolls”, the 2010-2011 theatre season at the Palace Theatre also features “The Importance of Being Earnest” and “Oliver”. But for all of us at Blue Heron Realty Co. , the icing on the cake for the performance of “Two Mrs. Carrolls” is that two of the actors on-stage are Blue Heron agents ! Maestro, drum roll, please ! Eva Noonan, an agent in our Cape Charles office, an effervescent gal who has performed in a number of Art’s Enter’s previous plays, takes the lead role in “Carrolls”. 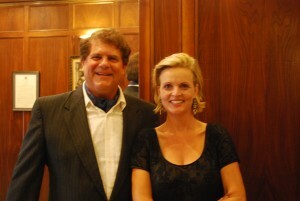 And David Kabler, our Cape Charles managing broker, will be making his stage debut. And so this week-end I will not only be feeding my mystery addiction at the Palace Theatre, I will be on hand to enthusiastically applaud two of our own. Break a leg, break two legs even, Eva and Dave !!!!! 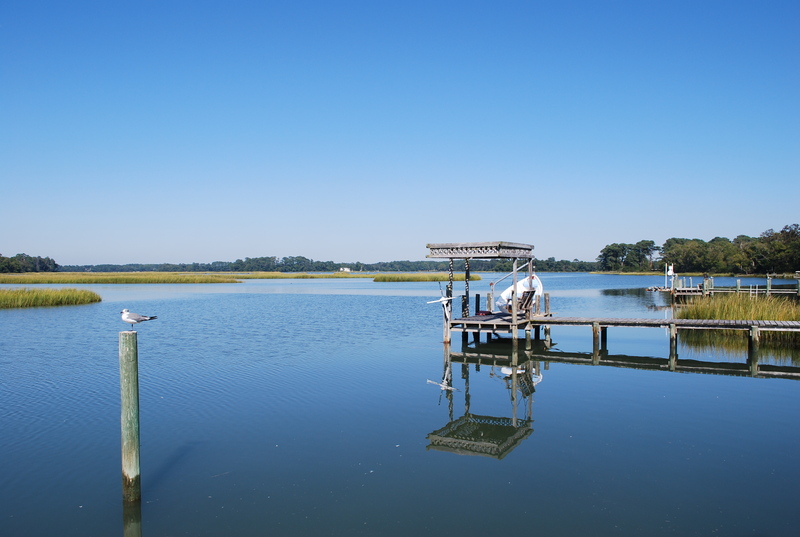 You are currently browsing the Life and Real Estate on the Eastern Shore of Virginia blog archives for September, 2010.